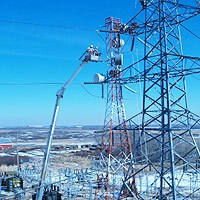 Job Requirements The customer needed to operate an aerial man basket in close proximity to active high-voltage power lines. The radio transmitter had to maintain a link to the receiver in the presence of 500,000 volts. Job Description As the power infrastructure ages, maintaining power lines is becoming more labour intensive and the need for increased productivity and higher levels of safety is ever increasing. BC Hydro required a control system that would be safe to operate in close proximity to high voltage power lines while they are still active. This is called live line work. The machine operator becomes part of the circuit and maneuvers the machine up to the active power lines and connects himself into the circuit through a special suit. 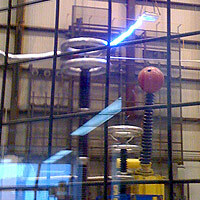 It is during this connection process that huge arcs of electricity are present. These arcs create the EM pulse that can knock out radio signals or by induction activate outputs internally to the radio system. By using an EEX rated enclosure for the transmitter we found that this will insulate the transmitter components and prevent any unwanted movement. Testing was done in a BC Hydro test lab to certify the safe operation in the field. The Result After careful design, testing, and implementation we were able to create a radio transmitter capable of operating safely in the presence of 500,000 volts of electricity.